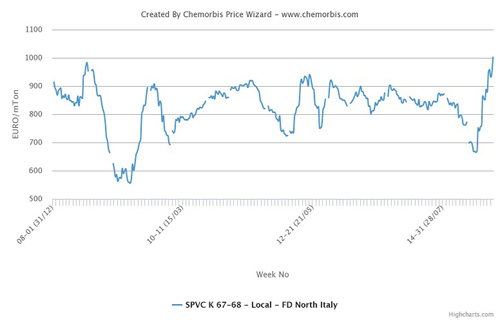 According to ChemOrbis, persistent production issues in Europe along with the settlement of the monthly ethylene contracts with a €60/ton increase paved the way for a fourth consecutive month of PVC increases. 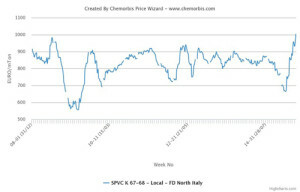 PVC hike requests of up to €100/ton were reported across the region while players in Italy reported that sellers’ hike targets are matching the increase in the ethylene contract for this month. Accordingly, spot PVC prices in Italy have reached a post-2008 record high recently on euro terms. A West European PVC producer, who raised its offers by €60/ton, indicated that there could be further hike requests for the rest of the month. “We are not able to guarantee the full requirements of our customers due to our force majeure declaration, which remains in place,” said a company source. Buyers are also aware of the degree of tightness across Europe. “On top of the already tight supplies, the high season for PVC applications may render sellers’ hand much stronger,” said a pipe maker in Italy. Buyers generally concur that it may be difficult to procure material this month too, expecting the initial hike requests of not more than €60/ton to materialize. The force majeure declarations on PVC stemmed from outages at several major crackers. The same problem for ethylene feedstock supply has pushed spot PE prices to a post-2008 record high in Italy as well.